Students and families listen to speakers discuss the importance of college at San Jose State University (Nov. 5, 2016). 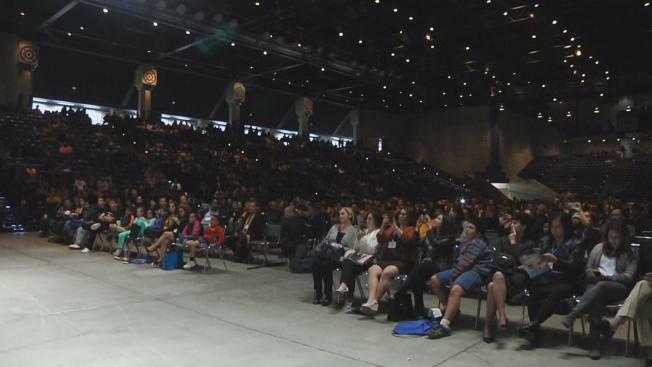 Thousands of Latino students from Santa Clara County were encouraged to make college a top priority Saturday during an event at San Jose State University. Both middle and high school students, along with their families, attended the educational event to learn about the necessary steps that need to be taken and accomplished so that the youngsters can step foot in a college classroom some day. Among an array of speakers, former astronaut Jose Hernandez motivated the crowd to plan adequaetly for the college application process.